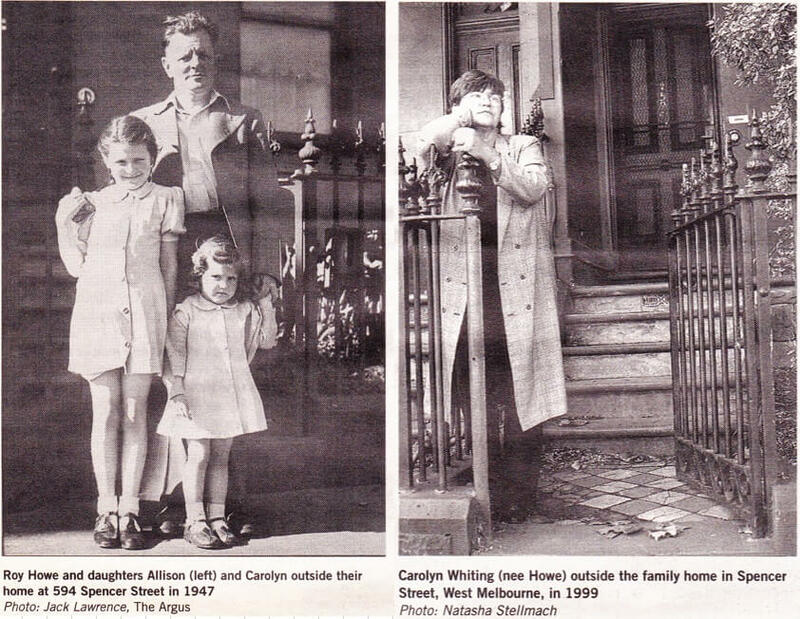 We lived in a two-storey terrace at 594 Spencer Street, West Melbourne, between Hawke and Abbotsford streets. My parents slept in the front room downstairs, next to the lounge room, which was only used on Sundays and special occasions. The kitchen had a one-fire stove, with wicker chairs either side of it, and in the corner stood a large wireless. There was a dresser for the crockery and another cupboard called a 'tallboy' which Syd had made. The kitchen table, which Mumma scrubbed each week with sandsoap, was made of pine and the chairs had kangaroo motifs carved on the back. There was also a miner's couch under the window, which opened onto the sideway. Out in the sideway, there was a gas stove, more cupboards and an old wash-stand with a marble slab on it, where we washed the dishes in a tin dish. There was no running water in the house. High on the wall outside the kitchen was a row of bells. Each room in the house had a handle set into the wall, which in earlier times was used to ring the bells downstairs, but they no longer worked. The walls of the sideway were painted with pale green calcimine, which was widely used at that time. If you brushed up against it, you got it on your clothes. The wash-house was outside the back door, which led from the sideway to the yard. It contained two roughcast troughs and a copper. Next to it was the bathroom in which the old bath had been painted but unfortunately, when we sat in it, the paint flaked off. The hot water was provided by an old chip heater and the light by a candle. The lavatory was situated at the end of the yard with a large lilac growing outside the door. Its bench seat was scrubbed each day with sandsoap, which had almost the same effect as sitting on a piece of sandpaper. The 'toilet paper' was newspaper (often The Sporting Globe, which was pink in colour) cut into large squares and hung on a piece of string. Allison was frightened of the dark, and even though I was six years younger, I would accompany her when it was necessary for her to go at night. I can remember being often left stranded outside in the rain and cold whilst she was inside with a candle or, in later times, a torch. Our front door was never locked and only closed in very cold weather. When the iceman delivered the ice, he would just sing out as he brought it in. My earliest memories are mainly of the kitchen, perhaps because our family life was centred around that room, especially in winter when it was the only room that was warm and cozy. The one-fire stove was nearly always alight, with lamb shank broth (or some other soup) cooking slowly in a saucepan and the kettle off to the side needing only to be moved into the middle to come quickly to the boil for a pot of tea. On Sundays, a roast dinner was cooked in the oven along with apple cake and scones. After Christmas Day each year, it was thoroughly cleaned and the gas stove was then used while the weather was very hot. Would you like to share your memories of living in West Melbourne? The Hotham History Project is planning to publish a people's history of West Melbourne and is looking for people who would like to be interviewed for our history. Some older residents may remember the Howe family in Spencer Street. Carolyn Whiting (nee Howe) was the youngest of six and she has written a vivid account of her childhood in the 1950s, excerpts of which are printed below. Her memories might spark your own memories of living in West Melbourne — and also of the small businesses, such as the corner grocery store, that were so much a part of everyday life. The Hotham History Project is also interested in photographs that depict the shops and streetlife of a bygone era. If you have any snapshots of houses and shops, we will arrange to copy them and return the originals to you. You can take them to our local history librarian, Heather McKay, at the North Melbourne Library or contact Mary Kehoe (9329 5814, mekehoe@iprimus.com.au) or Lorraine Siska (9328 1621, lsiska@bigpond.net.au). Please also contact Mary or Lorraine if you wish to be involved in helping to put our history together.